The USS Hoga, shortly after going into service in May 1941. On Dec. 7, 1941, the crew of the USS Hoga tugboat, moored in Pearl Harbor, watched as Japanese fighter planes relentlessly attacked the U.S. Navy’s battleships, spurring the U.S.’s entry into World War II. Within 10 minutes of the attack, the Hoga, which was equipped with firefighting equipment, was in action, heading toward Battleship Row. As she approached the burning ships, her crew rescued two sailors from the water, according to the book “Daughters of Infamy: The Stories of the Ships that Survived Pearl Harbor” by David Kilmer. The Hoga then went on to pull ships out of harm’s way, as well as fight fires on several ships, including the USS Nevada, USS Maryland and USS Tennessee. Finally, it reached the doomed USS Arizona, where it fought fires for two days. For their efforts, Admiral Chester A. Nimitz gave a commendation to the crew. 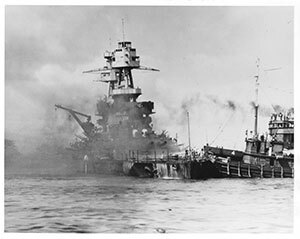 The USS Hoga, right, assists the sinking USS Nevada while also fighting fires on the ship on Dec. 7, 1941. 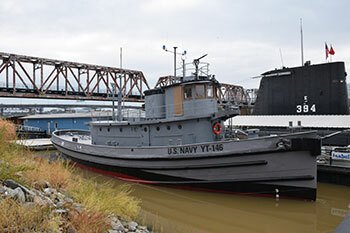 Those efforts 75 years ago will be commemorated on Dec. 7 at the Arkansas Inland Maritime Museum in North Little Rock where the USS Hoga, a National Historic Landmark and the last remaining floating Navy vessel from the Pearl Harbor attack, has resided for the past year. As part of the “Arkansas Remembers Pearl Harbor” program, a formal ceremony will take place at the museum, located along the banks of the Arkansas River, at 11:30 a.m. on Dec. 7. It will include presentations by state and local officials, along with food and refreshments. In addition, three surviving veterans of the Pearl Harbor attack are expected to attend, said Greg Zonner, executive director of the museum. The USS Hoga was built in 1940 and christened Hoga, a Sioux Indian word for fish, on May 22, 1941. She was assigned to Pearl Harbor shortly thereafter, making the trip from Norfolk, Va., via the Panama Canal. After Pearl Harbor, the Hoga stayed in service with the Navy until 1948 when she was loaned to the city of Oakland for use as a fireboat. The Hoga was declared a National Historic Landmark in 1989. In 1994, the city of Oakland returned the boat to the Navy. While docked at the Maritime Administration’s Suisun Bay Reserve Fleet off the coast of California, the Hoga became available for donation as a museum boat. While the Hoga was moored at Suisun Bay, then U.S. Rep. Vic Snyder, D-Ark., became aware of the Hoga’s availability for donation. He visited with then North Little Rock Mayor Patrick Henry Hays about the possibility of bringing the boat to North Little Rock, Donner said. 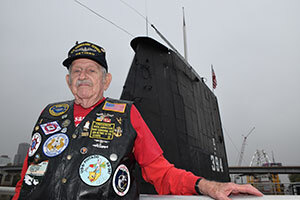 In 2002, a group of submarine veterans found out that the USS Razorback, a World War II submarine, was being decommissioned by the Turkish Navy, which had acquired it from the U.S. Navy. They approached Hays about securing it, and they agreed to work together to get both the Hoga and the Razorback, Donner said. The efforts were successful as North Little Rock beat out three other competing sites for the Hoga in 2005. The USS Razorback was secured earlier, arriving in Arkansas in 2004. With the USS Razorback, the Arkansas Inland Maritime Museum opened in July 2005. It wasn’t until last year, however, that the museum was able to bring the Hoga to its new home. “With the Hoga, we had to deal with the Navy and they had real stringent plans on what you could do and couldn’t do,” Donner said, adding that the big stumbling block was that they couldn’t “wet tow” the boat. After spending time at Mare Island in California for repairs, the boat was lifted onto a barge and towed to North Little Rock, arriving on Nov. 23, 2015. “It was not easy,” Donner said, adding that the museum had to raise about $700,000 to get the Hoga transported. 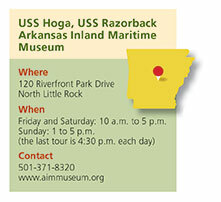 Although the public can see the USS Hoga in dock, no on-board tours are being offered yet. That’s because the Environmental Protection Agency (EPA) must first inspect the boat and clear it for tours. The museum is also working with the Arkansas Historic Preservation Program regarding restoration of the boat. “We are going to try to freeze it in 1945,” Donner said, adding that not much has changed on the boat since 1945 and he hopes it can be ready for tours by the summer of 2017. Although the spotlight is on the USS Hoga this month, the museum has another historic gem — the USS Razorback, which is open for on-board tours. While the Hoga made its mark on the first day of World War II for the U.S., the Razorback was one of 12 submarines present in Tokyo Bay on the last day of the war when the Japanese formally surrendered on Sept. 2, 1945. 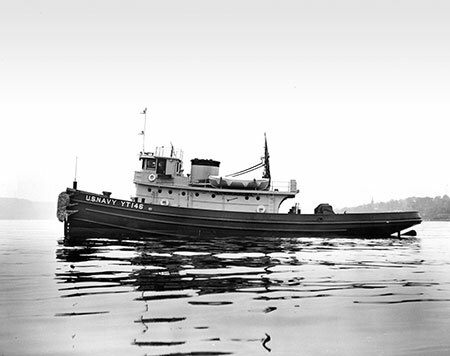 The Razorback went into service on Jan. 27, 1944. During World War II, she conducted five combat patrols during which she sunk Japanese vessels, captured Japanese prisoners of war and rescued downed American pilots. After World War II, the Razorback was part of the Cold War with Russia as it conducted surveillance patrols around Russian ports. In 1952, it was decommissioned to receive technological upgrades. It returned to duty in 1954 and continued in service, including the Vietnam War, until 1970 when it was transferred to the Turkish Navy. On Aug. 8, 2001, the submarine was decommissioned by the Turkish Navy and in 2004, it was transferred to the Arkansas Inland Maritime Museum. In addition to tours of the Razorback, the museum has exhibits on the Razorback and the Hoga, as well as the USS Arkansas battleship and the missile cruiser USS Arkansas. The museum also has a collection from the Arkansas River Historical Society about the history of the Arkansas River. To learn more about the museum, visit aimmuseum.org. To learn more about the “Arkansas Remembers Pearl Harbor” program, visit aimmuseum.org/arremembersdec7/.